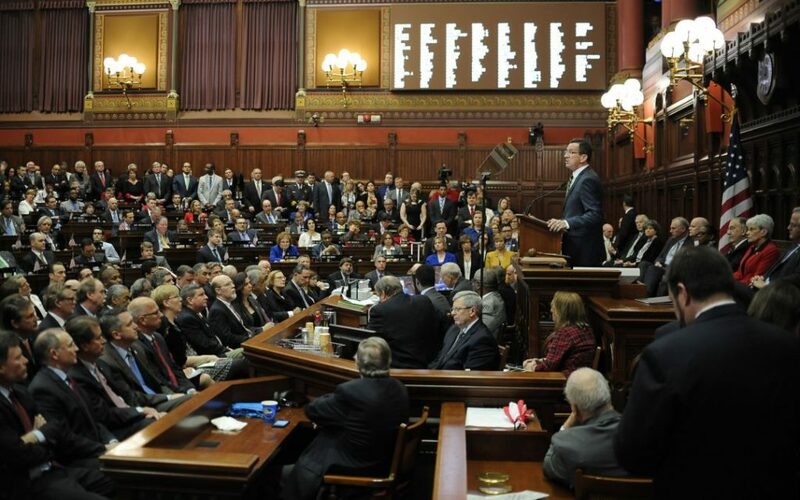 Lawmakers on March 27 voted to approve a collective bargaining agreement for Connecticut’s assistant attorneys general which included an 11 percent pay increase and bonuses, and the Appropriations Committee on April 1 approved a similar contract with the state’s tax attorneys. But if the rate of pay increases appears shocking, it isn’t: the raises were based on the 2017 SEBAC Concessions Agreement, and there are more labor contracts yet to come, including an arbitrated agreement for supervisors in the state’s Department of Correction. The 2017 SEBAC deal negotiated by Gov. Dannel Malloy and state union leaders guaranteed two 3.5 percent general wage increases along with step increases which equal about 3 percent of salary, bonuses and layoff protection between 2019 and 2021 in exchange for a three-year wage freeze between 2016 and 2019. According to the SEBAC deal, the state must offer the same pay rate increases and job security for any other bargaining unit “seeking the job security protections of the SEBAC 2017 agreement,” whether or not that bargaining unit is covered under Connecticut’s Office of Labor Relations. The Correction Supervisors Council signed on to the 2017 SEBAC deal to guarantee the bonus, wage increases, step increases and layoff protections, but the contract also included a 3 percent pay increase for Parole and Community Service Managers retroactive to 2015. The arbitrator awarded the deputy wardens 3 percent incremental increases in 2019 and 2020. The state had been seeking only a single 2.5 percent increase for 2019. The arbitrator awarded the deputy wardens 3 percent incremental increases in 2019 and 2020. The state had been seeking only one 2.5 percent increase. The arbitrator wrote the increases were in line with the SEBAC agreement and sided with the union on the incremental wage increases, but sided with the state in not granting a lump sum bonus to wardens at the top step. The Office of Fiscal Analysis estimates the contract will cost an additional $579,206 per year. The contract for the assistant attorneys general was approved by the Appropriations Committee and then by the General Assembly. The tax attorneys’ contract also passed the Committee but has yet to receive a vote. The state’s tax attorneys – a small, six-person unit in the Department of Revenue Services, which was added to the state’s P-5 Administrative and Residual bargaining unit — received 11 percent total pay increase, which combines two 3.5 percent general wage increases with two 2 percent step increases and a bonus. The total cost of the contract for the AAG’s was $3.3 million, according to the Office of Fiscal Analysis, while the Office of Policy and Management estimates the tax attorneys’ contract will cost only $87,508. According to testimony by Fae Brown-Brewton, undersecretary for the Office of Policy and Management, the wage increases for the assistant attorneys general were based on the SEBAC agreement, although she argued the 2 percent step increases were a “significant departure” from SEBAC because step increases are generally closer to a 3 percent increase. Brown-Brewton made the same argument in her testimony in support of the contract for the tax attorneys, noting that an arbitrator considers the wages of other similar groups of employees. But not all of the state’s bargaining units were a part of the SEBAC deal and separate labor contract negotiations are yet to come. The Connecticut State Police contract did not expire until after the 2017 SEBAC agreement was signed. The NP-1 bargaining unit is covered under the Office of Labor Relations, but their wage negotiations were not included in the 2017 SEBAC agreement. The State Police Union refused to re-open its contract for wages as part of the 2017 Concessions Agreement, meaning state troopers retained their 9 percent pay increase between the years of 2015 and 2018 outlined in their contract. The troopers did accept the pension and healthcare changes outlined in SEBAC, according to OFA. The State Police will not be guaranteed the same increases outlined in SEBAC because they did not agree to the wage changes, but it remains an outstanding labor agreement which will present another possible cost increase to the state as it faces down budget challenges. A resolution to approve the arbitrated contract for supervisors in Connecticut’s prison system will have a public hearing before the Appropriations Committee on Monday, April 15. This article was updated with details and a link to the arbitrated agreement and the OFA’s cost analysis. Dan Malloy really did a number on us.